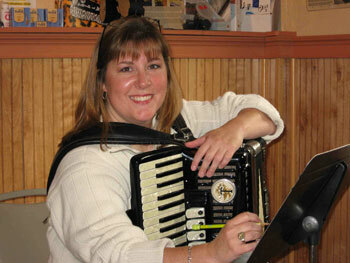 Rebecca Oliver picked up her first accordion in the summer of 1998 at Hanni Strahl's accordion studio in Austin, Texas. Quickly she realized that her life-long interest in the instrument was a love affair waiting in the wings. Rebecca had majored in music while in college, and although she had learned to play many instruments, the accordion was the one she knew she would be playing for the rest of her days. In the fall of 1998, Rebecca moved to Portland, Oregon with accordion in tow to attend Western States Chiropractic College. While in chiropractic college, Rebecca was a member of the Rose City Accordion Club in Portland and participated in the club's annual Accordion Camp in 2000 (which was great fun!). After graduating from Western States in 2002, Rebecca moved to New Hampshire to begin chiropractic practice. Shortly after arriving in New England, Rebecca found an opportunity to share her instrument, and played for two seasons in The Irish Show, Inc., a non-profit organization that raises funds for childrens programs in the Dover, NH area. In 2005 she became a student at the East Derry School of Music where she continues to study accordion and music under the tutelage of Jay Latulippe. Rebecca has played dixieland with The Mad Bavarian Brass Band, and currently plays with Opas Oompah Band, a traditional German band. Rebecca runs an active chiropractic practice, has a part-time scuba diving business with her husband Mark, and she continues to play, write and arrange music. She lives in New England with Mark and her two cats Cyril and Admeus, all of whom wish they could play the accordion, too.